Their research has shown that spacing out practice not only shows improved mental performance, but also applies to the physical environment, including sporting pursuits. 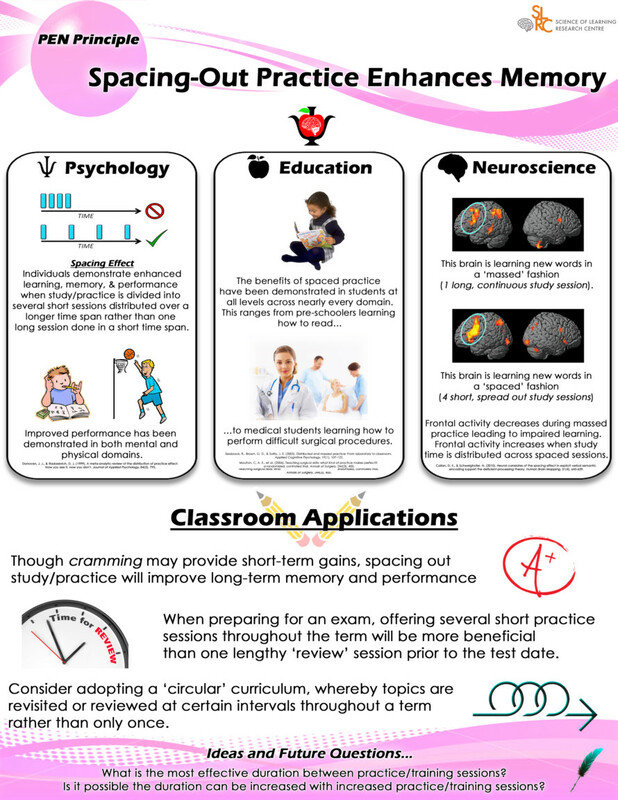 Individuals can expect enhanced learning and memory if practice sessions are broken up and spread over a longer timespan than if they are all clumped together in one long practice session. Neuroscientists have found that if learning is stretched over several short sessions, areas of the frontal control and deeper memory networks of the brain demonstrate enhanced activity. Spacing out practice has been demonstrated to assist all students ranging from young pre-schoolers learning how to read through to university medical students learning how to perform difficult surgeries. As a result, researchers are recommending that teachers schedule regular review sessions during a school term to revisit the previously learned material rather than rely on one large session just prior to exams or the end of term.